We have had our oldest son and his girlfriend here for a visit this week - the time has flown by and they are heading for New York tomorrow and then back to San Francisco on Sunday. Our younger son is also leaving tomorrow to start his concert tour so our house will go from very busy to very quiet! 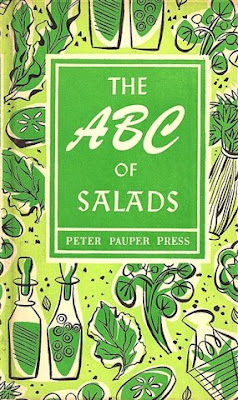 Everyone in our family loves to go to used bookstores to look for interesting treasures and, while they were exploring the town, they found this great salad recipe book from 1958 in one of the shops in Concord. When I looked at the cover and saw the font used I immediately thought of the George font and I had to open up Design Studio to compare the two. Here is the word "salads" previewed in George. The two do not match but the extra stroke on the top of the "A" is somewhat similar and they have the same overall "look." I suppose it is just a funny coincidence - a bit of serendipity. 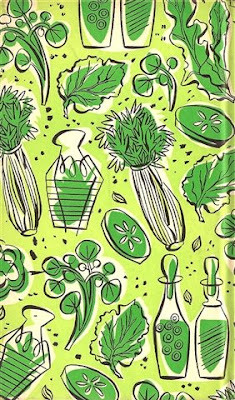 I love the 50's style of the cover design and I actually scanned the illustrations and poems inside. I thought I'd share a few with you. 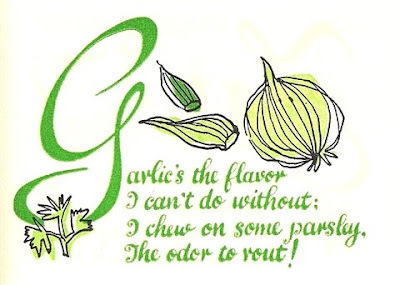 This poem for the "G" recipes is particularly appropriate since our son's girlfriend is from the city of Gilroy in California - "The Garlic Capitol of the World." Here is a LINK to the website about the Garlic Festival which is held there in July each year. It sounds like a lot of fun. 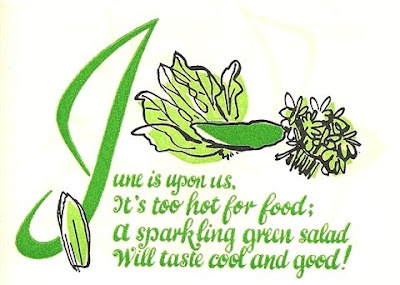 June is nearly here - so it is time for salad! It really isn't very hot here yet - today was chilly and damp but the weather should get warm soon. I enjoyed this "musical" rhyme! I am sure I will find a way to incorporate some things from this book in future projects. Here is a photo of our family after our farewell dinner tonight - the restaurant owner took this photo for us (oldest son and his girlfriend on the left, youngest son and his girlfriend on the right and a high school friend of oldest son who joined us for dinner is in the middle). Once I get the travelers delivered to the station for the trip to New York, I will have some quiet time tomorrow to test cut some of the designs that are waiting in my Projects folder. I also had a very unexpected and exciting email arrive today and there will be a lot of surprises coming to my blog soon! 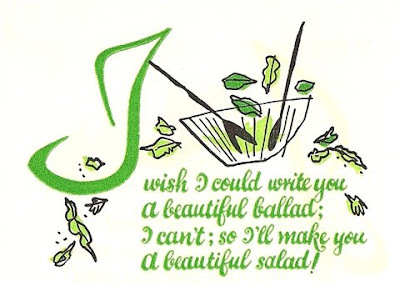 Diane, I love the poems and the copies from the recipe book. And wanted to tell you that you have a beautiful family. I know you must be so proud of each. Thanks for sharing with us. Thank you so much for reviewing the Stand and Salute Cartridge. I appreciate how thoroughly you highlight the details! After reading your blog, there is no question that I will be purchasing this cartridge! Provo Craft hit the nail on the head by asking for your input. I think you are very in tune with the cricut population! Thanks for all of your sharing designs and stories. Love reading your daily messages and seeing your beautiful ideas. Have a great day of quiet time!! A Card and a File! What happened to the Garden Gnome?